The Shunshanji site is located in about 500 meters southwest away from the Daxinzhuang, Meihua town, Sihong county. This site, which is on the north slope of the Chonggang mountain, covers almost 175,000 square meters. In order to prevent the site from being destroyed and to understand its cultural connotation, Nanjing Museum and Sihong Museum jointly excavated this site three times from 2010 to November of 2012 and the total excavated area was 2500 square meters. The excavation confirmed a prehistory moated settlement dating to about 8,000BP, while discovered 92 tombs dating to the Neolithic period, 26 ash pits, 5 house foundations, 3 kitchen ranges ruins, a large area of burned earth deposit and a dog pit, and found over 300 pieces of potteries, stone, jade and bone artifacts. A large number of animal bones and fish bones were deposited in the moat and carbonized rice remains were floated from many features. After preliminary analysis, this site could be divided into three phases in the Neolithic period. The moat was firstly discovered on the profile of a sand-collection pit within the site. Later on, it was cored in a large area and its plane layout and size were confirmed. Based on the result of coring, a few locations were selected for excavation. The moat was about 230 meters wide in east-west direction and about 350 meters long in south-north, while the perimeter was near 1000 meters and the area within the moat was near 75,000 square meters. The north part of the site is the highest place and it is getting lower towards the south. To the southernmost is the Zhaozhuang Reservoir where was originally an east-west natural river course, which enclosed the site together with the moat. The widest part of the moat is close to the sand-collection pit in the north and was up to 24 meters wide while the general width was around 15 meters. The deepest part is to the north of the widest part and the depth was over 3 meters. According to the excavation result of the east part of the moat, the moat’s bottom was flat and the slope is mild. The outer moat wall was steep and the inner moat wall was mild and uneven. The deposit outside the moat generally directly extended to the inside moat and overlapped the deposit inside the moat. The deposit inside the moat mostly dated to the phase II and III of Shunshanji period. It was presumed that the function of the moat was originally for defense and drainage, but became a place for the production and domestic garbage after it was abandoned. This explained the reason that the pottery shards were relatively few in the remains of the phase II and III. The remains of the phase I was mainly inside the moat. Among them, the deposit of residential in the northwest was the richest. Some features were discovered, including 2 house foundations, 17 ash pits, 3 kitchen ranges and 1 dog pit, represented by F1, F2, H3, H4. There were one shallow crypt type house ruins and one ground-build type house ruins. F1 was a shallow crypt type house ruins and it was almost an ellipse in plane, covering 7.5 square meters. Outside the living area were a circle of small post holes. The doorway faced to the south and the kitchen pit, where a pottery stand existed, was located in the north part inside the house. The remains of kitchen ranges and the dog pits were located near the house ruins and the remains of kitchen ranges were on the living area near the house ruins. The hearth of Z2 and the burned area co-existed and the other two only had the burned area existed. This type of features was the result of the outdoors cooking and the burned area formed due to the fire. The dog pits had the whole dogs buried and were related to the house construction. The remains dating to the phase I was mostly round-bottom artifacts, and then flat-bottom and a few short ring-foot. The basic artifacts assemblage were fu釜cauldrons, guan罐jars, bo钵bowls, pen盆basins, stands, etc. Among them, cauldrons were the majority. Among them 90% were sand-tempered potteries and a few were temperless. Sand-tempered potteries were mainly red outside and black inside. They did not have an even color with thick embryo and their shapes were usually irregular. The temperless potteries were mostly in red coating. Their surfaces were mainly plain, but some of them decorated with fingernail, pressing, nail, additional heap and hollows patterns etc. The fingernail patterns and pressing patterns were mostly decorated outside the lips of cauldrons. Stone tools were rarely unearthed and mostly coarse. The stone tool types included axes and adzes etc. Only one jade pipe was found, which was tube drilled from double sides and polished. The remains dating to the phase II had a larger coverage than the phase I. The phase II crossed the moat and formed a special burial area outside the moat. During the twice excavations, the remains dating to the phase II were the majority, including 3 house foundations, 70 burials, 5 ash pits and a large area of burned earth. The house ruins during this phase covered larger areas than the phase I. The area of F5 reached to 22 square meters. The houses were built above ground and surrounded by a circle of post holes. And there were 1-2 posts in the center. In the center of F3 and F5, flake-shaped burned earth could be seen and pottery stands could be found too. In the center of F4, there was a repairable round-bottom cauldron with a handle. The burials were located in the northwest of the site outside the moat. Most of them were destroyed and the human bones were badly preserved. These burials were rectangle earth shaft tomb and arranged in sequence by rows. Intrusion rarely happened. The burials mostly faced to north and slightly east, and a few faced south. Most of the burials had no grave goods. The burials with grave goods had 3 pieces as the maximum. 1-2 grave goods were the usual situation. The grave goods included cauldrons, bowls and bottles etc. Except a few deceased being in one’s side, the rest were all in extended supine position. The burials with single person were the majority but there were a few burials with two persons or more. M30 was a multi-person burial and the skeletons were preserved badly. Based on the bones of lower limbs, they at least belonged to six individuals, who were buried in extended supine position and the skeleton were arranged closely. According to the teeth of 3 individuals, they were roughly 12-15 years old but their genders were not clear. There were 3 grave potteries including one bottle, one jar and one bowl, which were all located at the top of the head of the dead. The artifacts dating to the phase II were mostly round-bottom and flat-bottom. Ring-bottom artifacts only included dou plate and excluded tri-foot artifacts. The basic artifacts assemblage was cauldrons (the majority was round-bottom and minority flat-bottom cauldrons), double-ears jars with flat-bottom, bo bowls, kitchen ranges, stands etc. In addition, there were models of spoons, dou plates, bottles, stands, cups, lids, spindles, figures and so on. Most of the cauldrons were cylindrical in deep abdomen. They mostly had open mouth in the early phase and looked like helmets. In the late phase, the diameter of the mouth was getting smaller and the abdomen was getting deeper. Moreover, the cauldrons with flower mouth occurred. Sand-tempered potteries were the majority, reaching to 99%. Plant-tempered potteries, temperless potteries and sand- and mica-tempered were rare. The pottery color was not even. The sand-tempered potteries were in red or grey-brown and the inside of the potteries were usually black, caused by carburization. The potteries were mostly plain in surface but a few were decorated with nail, engraved lines and hollow holes patterns etc. The stone tools included axes, adzes, balls and so on. And there was only one fragmentary grinding slab with stands. In addition, a large number of elks’ and pigs’ bones were discovered in the deposit of the moat. The remains dating to the phase III extended to north, east and southeast of the moat based on the phase II. The remains in this phase concentrated in the burial area and the features and artifacts were not much. There were 22 burials, 4 ash pits excavated. The burial area was located outside the southwest moat. The burials were mostly in south-north direction and faced to south. Some of burials were large in size and their grave goods were plenty, for example, 9 grave goods were found in M98, including cauldrons, ring-foot plates, and bo bowls etc. The grave potteries included cord-pattern cauldrons, ring-foot plates, bo bowls, bottles and lids, etc. The potteries dating to the phase III were mostly round-bottom, and then flat-bottom and a few ring-foot artifacts. The basic artifacts assemblage was cauldrons, bo bowls, bottles, basins and stands etc. Moreover, there were jars, stands, lids, files, spindles and so on. Sand-tempered potteries were the majority, close to 99%. The colors of the sand-tempered potteries were red or brown and rare gray and black. Some of the sand-tempered had plant mince as temper. The embryos of potteries were mainly thin and the surfaces were coarse with obvious sand grains. The potteries were mostly plain on surface and the number and types of the decoration patterns were rare, including cord, hollow hole, engraved lines and additional heap patterns, etc. The long and narrow crescent handle was the common decoration. Only a few stone tools were found, including axes, adzes and balls etc. In addition, only one jade adze was found which was unearthed from the deposit of the burial. Because the remains dating to the phase I of Shunshanji was very similar with those dating to the phase II, they should be in the different development phases of the same culture. The prehistory cultural elements from the middle reaches of the Yangzi River during the phase III were obvious and very different from those during the phase I and II. This difference should happen in different cultures. The remains dating to the phase III were disclosed in a small area and the unearthed artifact were not rich and the cultural connotation was not clear. The remains dating to the phase III could possibly be further divided into sub-phases. So much attention should be taken in the future work. The Shunshanji site is located in the middle and lower reaches of Huai River in the northwest of Hongze Lake. Laosui River is 5km east away from this site. 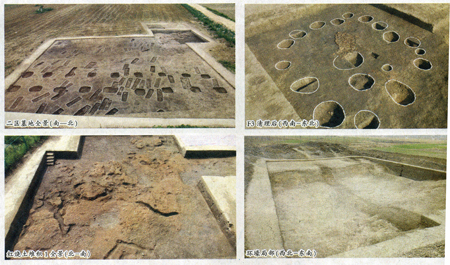 The remains dating to the phase I and II of Shunshanji was similar with the remains dating to the early phase of the Shishanzi site in Suixi county, Anhui province. The middle and lower reaches of Huai River was an independent cultural area at around 8000 BP and comprehensively communicated with the cultures in the upper Huai River, Haidai district and the middle and lower Yangzi River.